Randall was very busy when information on the Parliamentary Petition was initially circulated so Mary volunteered for the role of coordinator in North Shropshire. 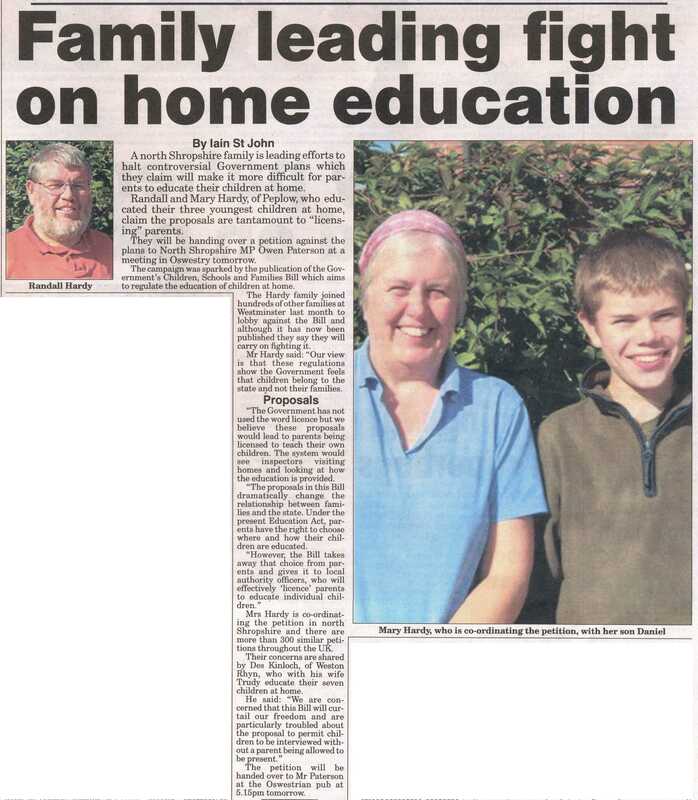 However he did write a press release which led to this article appearing in the Shropshire Star. A north Shropshire family is leading efforts to halt controversial Government plans which they claim will make it more difficult for parents to educate their children at home. Randall and Mary Hardy, of Peplow, who educated their three youngest children at home, claim the proposals are tantamount to “licensing” parents. They will be handing over a petition against the plans to North Shropshire MP Owen Paterson at a meeting in Oswestry tomorrow. The campaign was sparked by the publication of the Government’s Children, Schools and Families Bill which aims to regulate the education of children at home. The Hardy family joined hundreds of other families at Westminster last month to lobby against the Bill and although it has now been published they say they will carry on fighting it. Mr Hardy said: “Our view is that these regulations show the Government feels that children belong to the state and not their families. “The Government has not used the word licence but we believe these proposals would lead to parents being licensed to teach their own children. The system would see inspectors visiting homes and looking at how the education is provided. “The proposals in this Bill dramatically change the relationship between families and the state. Under the present Education Act, parents have the right to choose where and how their children are educated. “However, the Bill takes away that choice from parents and gives it to local authority officers, who will effectively ‘licence’ parents to educate individual children.” . Mrs Hardy is co-ordinating the petition in north Shropshire and there are more than 300 similar petitions throughout the UK. 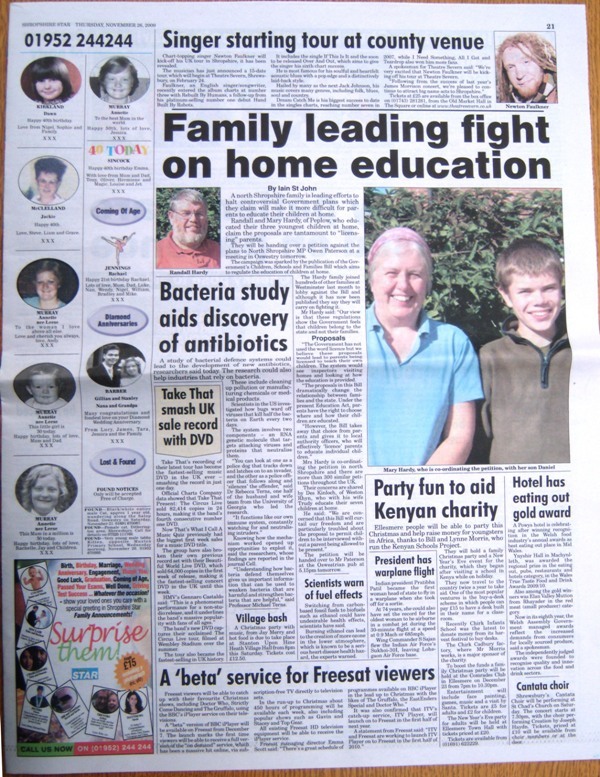 Their concerns are shared by Des Kinloch, of Weston “Rhyn, who with his wife Trudy educate their seven children at home. The petition will be handed over to Mr Paterson at the Oswestrian pub at 5.15pm tomorrow.